If you have any questions or queries about framing any sort of object, get in touch and we will try to help. Well, at least there are some daffodils in the shops now as well as showing beautifully in the garden beds around Hythe. If you get round to spring cleaning or re-decorating, you may find that your walls will also benefit from a new look with some refreshed artwork. So if want to have some items framed or even re-framed, don’t forget that we offer free quotations ands free advice. Pop in and see us. My lovely assistant Ziggy is here on some Friday mornings and you can be assured of a warm welcome. This years Hythe Festival runs from 07 July to 15 July. As always there is a wonderful programme of events every day that will spoil you for choice. Full details can be found at www.hythefestival.co.uk. Our shop in the Malthouse Arcade will be closed on Friday 29 and Saturday 30 June but will be open as usual from 06 July. Because the weather is so challenging at the moment, travel around Hythe is at times very difficult. Therefore we have decided that our shop in the Malthouse will be closed this weekend the 2nd and 3rd March. Normal service will be resumed next weekend. If this presents you with any problems, let us know and we will try to find a solution. Thank you to all our lovely clients for your continued support and we send you our best wishes for a Merry Christmas and a wonderful 2018. Our Malthouse shop is now closed and will re-open on Friday 5th January 2018. 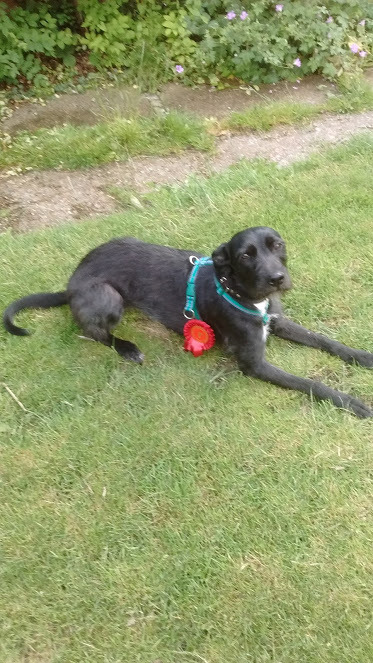 It’s been some time since I introduced you to my new assistant Ziggy the lurcher, so I think a progress report is due. Ziggy is nearly three years old now and comes to the Malthouse with me occasionally, where she has learned who keeps the doggy biscuits and where the jar is! It is fair to say that she probably enjoys her long walks more than being in the Malthouse as the picture above shows. She has developed into a wonderful companion and constantly amuses us with her zest for life. Ziggy is also a regular visitor to the picture framing workshop. Her challenge there is to try to sneak off with bits of wood without me noticing. She will be very pleased to meet you when you come to our shop in the Malthouse if she is helping out that day. Have the cold weather spells ended? Hope the current spell of sunny days continues. The birds have started to sing again, and Ziggy the lurcher and I are enjoying listening to them during our early morning walks. 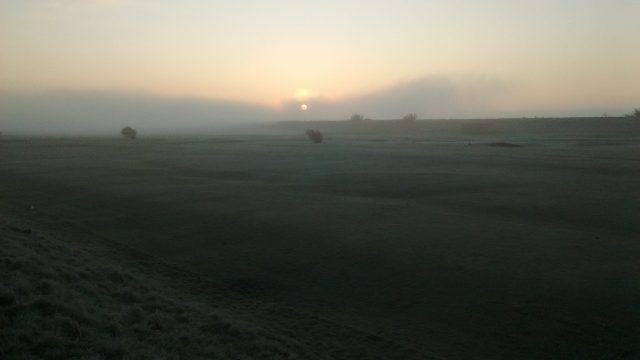 The picture above was taken during one of our walks on a very misty morning looking over the Hythe Imperial Golf Course towards the sea. This is a good time of year to start thinking about framing of pictures and souvenirs. Pop in some time and have a look at the new range of mouldings that we have added to our range – they just might suit your project. Although we will always do our best to help out with urgent jobs, deliveries of our supplies become a bit more erratic during December. Our shop in the Malthouse will be closed on 23rd, 24th, 30th and 31st December 2016, so the cut off date this year for Christmas deliveries is 3rd December. We wish you all a Happy and Peaceful Christmas and look forward to seeing you in the New Year. 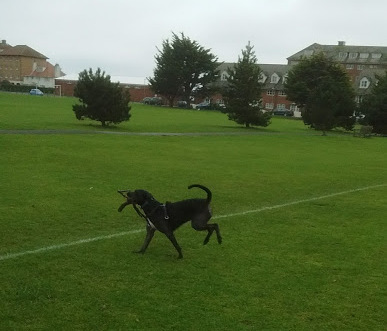 Earlier this year we met Ziggy a young lurcher for the first time and were thrilled when she chose us for her new home. She is about 22 months old now and has had a busy summer training us to understand her requirements. Along the way we have had lots of fun and she has met loads of new friends. Needless to say, long walks have become almost the best part of the day for her. Now Ziggy is a little older she has been ‘helping’ me occasionally in the Malthouse. Come along and meet her sometime and she will be very very pleased to see you! Come along to St Leonard’s Church on the 8th and 9th of October 2016, and visit the first Arts and Craft Fair held in this wonderful 800 year old building that overlooks the town. We shall be among about 40 exhibitors and shall be pleased to see you and to offer you a special Craft Fair discount voucher. Quilters, artists, textiles jewellery and many other crafts will be on display. OK, so the cooler weather did not last long but our offer still applies! Our retail unit is in the Malthouse Arcade in Hythe at the west end (ie Dymchurch end) of the High Street. Our Unit Number is 17 and we are on the mezzanine level on the stairs at the end of the ground floor. The Malthouse is open on Fridays and Saturdays. Copyright © 2001–2019 Fairlight Frames. All Rights Reserved.